Combining Wakame Bioferment (seaweed) Extract, Gotu Kola, Lactic Acid, Licorice and Argan Oil, Valentia Clearlift Revitalizing Serum can help to oxygenate, revitalize, firm and hydrate the skin while it improves cell turnover, fades the appearance of acne marks and hyperpigmentation to impart a brighter, fresher complexion. 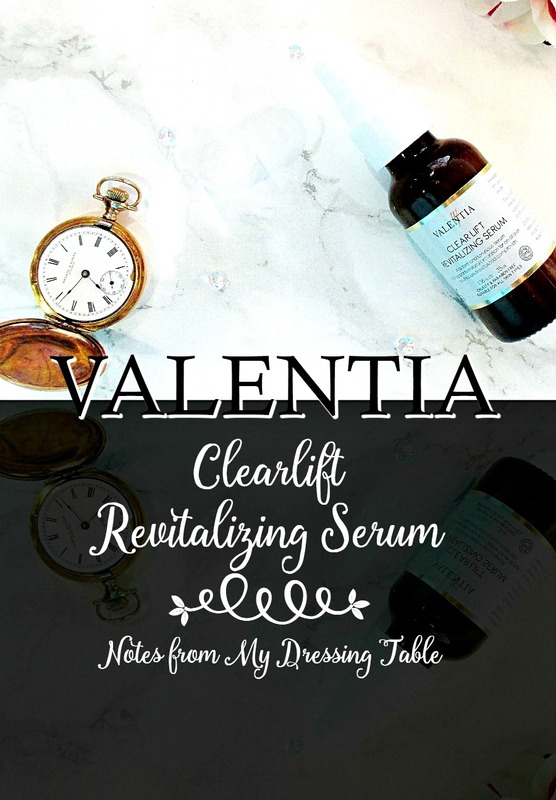 Valentia Clear Lift Revitalizing Serum is a lightweight, silky serum that drops instantly into my skin. 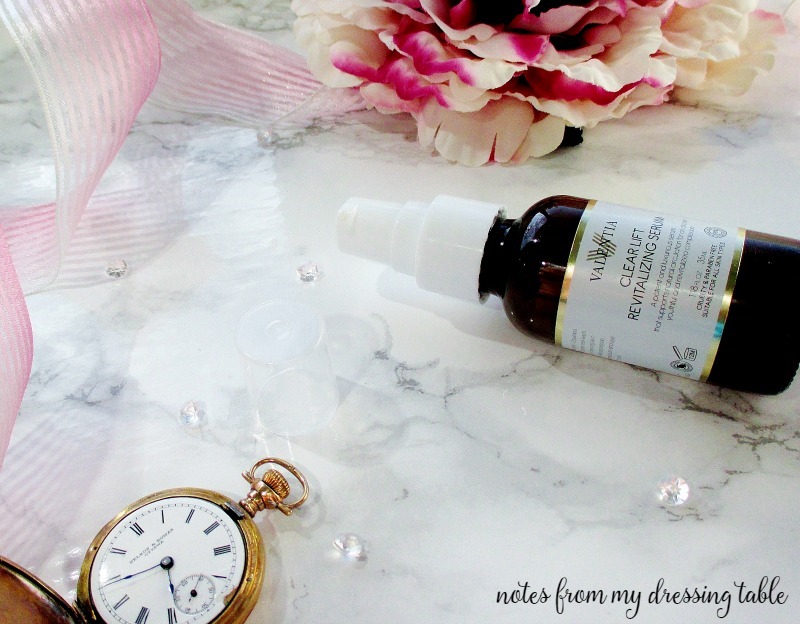 I like to use this serum in concert with other serums in a "cocktail" morning and evening, combining the actives in this serum with others to amp up the anti aging and skin improving aspects of all of my skin care. I have been using this serum for a while now and I have to say, I like it! 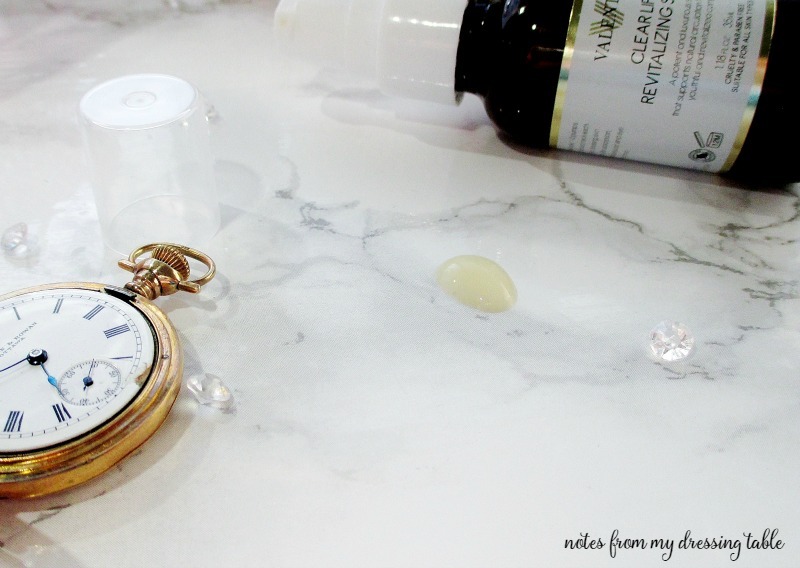 I am impressed with how well it slots into my skin care routine and is so affordable, too. Citrus Aurantium (Orange Hydrosol), Organic Aloe Barbadensis Leaf Juice (Aloe Vera), Hamamelis Virginiana (Witch Hazel), Cassia Angustifolia Seed Polysaccharide (botanical hyaluronic acid), Globularia Cordifolia Callus Culture Extract (plant stem cells), Sodium Lactate (Lactic Acid), Undaria Pinnatifida Cell Culture Extract, Organic Simmondsia Chinensis (Jojoba Oil), d-Alpha Tocopheryl Acetate (Vitamin E), Organic Glycyrrhiza Glabra (Licorice), Wildcrafted Arnica Montana (Arnica), Organic Argania Spinosa (Argan Oil), Proprietary Silk Protein Amino Acid Blend, Acrylates/C10-30 Alkyl Acrylate Crosspolymer, (2s)-2-Amino-5-guanidinopentanoic Acid, Citrus Clementia Hort ext Tan (Clementine Essential Oil), Camellia Oil, Organic Rosa Canina (Rosehip Seed Oil), Organic Centella Asiatica (Gotu Kola), Wildcrafted Equisetum Arvense (Horsetail), Wildcrafted Taraxacum Officinale (Dandelion), Wildcrafted Geranium Maculatum (Wild Geranium), Alcohol, Lecithin, Ethylhexyl Glycerin, Phenoxyethanol. Valentia Clearlift Revitalizing Serum is a beautiful and affordable addition to any skin care routine. It can be purchased on the Valentia website and from Amazon. Have you tried Valentia skin care? Valentia formulates their products with natural and organic ingredients here in the US using sustainable energy and their products are cruelty free.